Former High School Musical star Vanessa Hudgens has been fined $1,000 (£700) for a public Valentines Day message to boyfriend Austin Butler. Hudgens and Butler have been dating for over four years, despite reports of heartthrob Zac Efron’s recent attempts to win back Vanessa. However, a romantic trip to Sedona, Arizona on Valentine’s Day has landed the couple with a hefty fine. 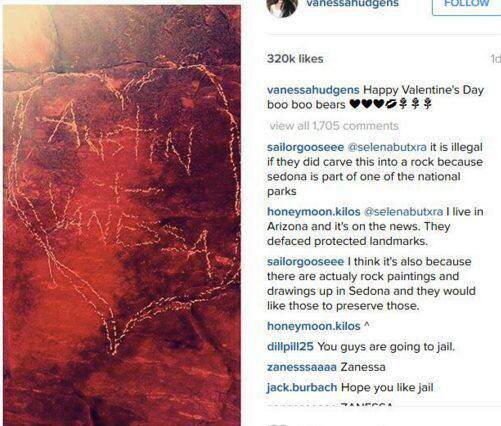 In a gesture of love Vanessa allegedly carved her and her boyfriend Austin Butler’s names into an ancient red rock, reports Mashable. Hudgens’ own Instagram followers alerted Coconino National Forest about the carving – an offence that could have landed her up to six months behind bars and a maximum fine of $5,000 (£3,482). Not very loyal of her Instagram ‘fans’ – ouch. The actress got off comparatively lightly with just a $1,000 fine for a ‘misdemeanor count of damaging a natural feature on U.S. Forest Service Land’. Her partner Austin Butler, actor, singer, and model, is currently starring as Wil Ohmsford in The Shannara Chronicles on MTV. It’s unclear whether they decided to ‘go Dutch’ on the fine.